The Loire Valley invites visitors to step into the scene of a fairy tale, complete with stunning castles and an enchanting countryside. Known as the "Garden of France," the entire area of the Loire Valley is listed as a UNESCO World Heritage Site. Because of its beauty, the Loire Valley was frequently visited by the French kings. The region has been strategically important since the Middle Ages and Hundred Years' War, but the Loire really came to life during the Renaissance. During the 15th and 16th centuries, the French Kings dreamed up a vision of luxury and opulence and built extravagant country retreats amid the Loire's woodlands and rivers. These lavish royal castles became legendary, and rich nobles followed suit by creating their own grand homes in the area. The sumptuous Renaissance châteaux were designed purely for enjoyment and entertaining, an extension of court life outside Paris. The grandiose Chambord is the most magnificent château, while Chenonceau is the most elegant. Find the best things to see and do in the region with our list of the top tourist attractions in the Loire Valley. In a majestic location on the left bank of the Loire River, the Château of Chambord is the most emblematic Renaissance monument in France. A breathtaking sight to behold, this enormous castle provided inspiration for the building of the Château de Versailles. The estate was created in the early 16th century (at the height of the French Renaissance) for King Francis I, who spared no expense. The building was constructed on a scale of immense proportions, measuring 117 meters by 156 meters. With turreted towers, impressive vaulted ceilings, 440 rooms, and a gigantic double-helix staircase at the entry hall, the Château de Chambord is definitely fit for royalty. Louis XIV (the "Sun King") frequently resided here, hosting extravagant gala balls, hunting parties, and amusing soirées. The celebrated playwright Molière presented his comedy Le Bourgeois Gentilhomme while he was staying at the château as a guest of Louis XIV. The extensive property of Chambord is encircled by a 32-kilometer wall (the longest in France), with six gates that allow access to the grounds. Of the property's 5,500 hectares of parkland, four-fifths is pristine forests. Visitors are dazzled by the French Formal Gardens that are landscaped in geometric patterns with perfectly manicured shrubs and tidy flowerbeds. The garden's Italianate terrace was a central feature of court life when the king was in residence. Today Chambord is a must-see destination in the Loire Valley, about a two-hour drive from Paris. Tourists can take an 80-minute train ride from Paris Austerlitz station to the Blois Chambord station, which is a 25-minute shuttle or taxi ride away from the château. An elegant château with a distinctive feminine touch, Chenonceau was strongly influenced by the famous women who have lived here. Thomas Bohier acquired the Château de Chenonceau in 1512, and his wife, Catherine Briçonnet renovated the medieval castle by rebuilding it in Renaissance style with a spacious central entrance hall and Italianate staircase. After being acquired by the Crown Estate in 1535, the château became the property of King Henry II, who presented the château to his mistress, Diane de Poitiers, in 1547. Henry's widow Catherine de Médicis, who took over the royal residence in 1533, was responsible for creating the most unique feature of the château, the Corps de Logis. This two-story gallery stands upon a graceful arched bridge that crosses the Cher River, giving the impression that the château is floating on water. To further impress visitors, the Corps de Logis gallery displays fine paintings and antique tapestries. With an air of both delicacy and grandeur, the château's stately halls once provided the ideal setting for refined social gatherings. Equalling the beauty of the interior, the château's Renaissance French Gardens is landscaped with decorative pools and flower beds. The garden's spacious "floating parterre" (raised terraces covered with lawn) was the creative vision of Diane de Poitiers. In the Garden of Catherine de Médicis, roses flourish on trellises of a walking path, which overlooks the castle moat, a sublime scene sure to inspire leisurely strolls. On summer weekend evenings, the gardens take on a magical glow, illuminated by hundreds of lanterns for Nocturnal Promenades (Night Walks). Another reason to linger at the château is the property's fine-dining restaurant, L'Orangerie, which serves gourmet cuisine in an exquisite dining room. The château also has a tea room with an outdoor patio in the Green Garden, a casual self-service restaurant, and a crêperie, as well as shaded picnic areas. Château de Chenonceau is accessible by the rapid-speed TGV train (a one-hour ride) from the Paris Montparnasse station to the Tours station. By car, it takes about two hours to reach Chenonceau from Paris. The charming old town of Chartres is crowned by the UNESCO-listed Cathédrale Notre-Dame de Chartres, an important pilgrimage destination during the Middle Ages. This awe-inspiring French Gothic church stands in an elevated position, with its soaring spires visible from a distance. Built in the 12th and 13th century, Chartres Cathedral is one of the finest and best-preserved medieval churches in France as well as an important landmark of Christian art and architecture. 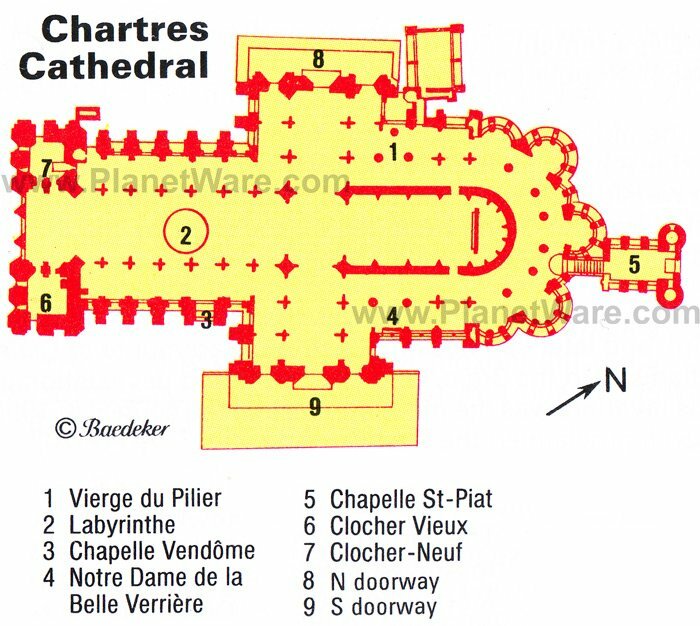 The influence of Chartres Cathedral is seen in many other Gothic cathedrals in Europe, including Amiens and Reims in France, Westminster Abbey in England, Cologne Cathedral in Germany, and the Catedral de León in Spain. The stained-glass windows of Chartres also inspired similar workmanship at the cathedrals in Bourges, Le Mans, Poitiers, Rouen, and Tours in France, and Canterbury in England. Chartres Cathedral features a highly ornamental facade centered around the Royal Portail (doorway) adorned with monumental Old Testament figures, an early form of Gothic sculpture. The cathedral is most renowned for its abundance of intricately detailed medieval stained-glass windows (nearly 3,000 square meters) that are perfectly conserved; most of the windows date from 1210 to 1260, an exceptional rarity in existence. Particularly breathtaking are the three immense rose windows. Other notable features in the cathedral are the Late Gothic choir screens with scenes from the life of the Virgin and the Gospels, and the terrace with a panoramic view of the lower town. During summertime (on Sunday afternoons in July and August), the cathedral presents sacred music performances (free of charge) as part of the International Organ Festival. Chartres is an easy day trip from Paris, approximately a 90-minute car ride from the city center or train ride from Saint-Lazare station. Boasting many old palaces and burghers' houses, the old ducal city of Bourges enjoys a picturesque setting on the Yèvre and Aveyron Rivers in the historic province of Berry. The town's top attraction, the UNESCO-listed Cathédrale Saint-Etienne ranks among the most splendid of French cathedrals built in the 12th-13th centuries. The ornate west front, flanked by massive towers, has five doorways with rich sculptural decoration and an exquisite 14th-century rose window. The cathedral is entered through the Romanesque south doorway, over which is a figure of Christ in Majesty, surrounded by the symbols of the four Evangelists. The interior stuns visitors with its gorgeous sanctuary illuminated by 13th-century stained-glass windows. In a chapel near the choir are interesting 15th-century kneeling figures of the Duc Jean de Berry and his wife. Tourists can also climb to the top of the north tower to take in spectacular views. Another noteworthy building is the Palais Jacques Côur, a palace built in 1443-1453 by the royal treasurer Jacques Côur, exemplifying secular Gothic architecture. About a 30 minutes' drive southwest of Bourges is the 12th-century Cistercian Abbey of Noirlac, a fantastic example of Cistercian architecture with an arcaded cloister dating from the 13th and 14th centuries. A private estate in a tranquil countryside setting near a vast forest, the Château of Cheverny dazzles visitors with its enchanting gardens and magnificent interior. Cheverny Castle claims to be the most fully furnished and decorated of the Loire châteaux. Built in the early 1600s in harmonious Classical style, this exceptional manor house has been home to the same family for more than six centuries and opened its doors to the public in 1922. The grand halls and remarkably well-maintained apartments of the château are graced with the original furniture and decor, such as a 17th-century Gobelin tapestry and a Louis XIV chest, which provide an insight into noble life centuries ago. The entryway features an elaborately designed stairway, while the main rooms are embellished with Louis XIII boiseries (intricately carved paneling). For those more interested in French popular culture, the château has an exposition of Tintin comic strips. One of the highlights of the Château of Cheverny is the English-style park, a bucolic expanse of tidily manicured green lawns shaded by giant redwoods and cedar trees. The more adventurous can rent an electric car to take a spin through the property's forest path. Another enjoyable way to take in the scenery is by gliding around the lake on an electric boat. When visitors are in need of refreshments, the Café de l'Orangerie delights with its fancy pastries, homemade ice cream, snacks, and beverages, served in the 18th-century orangery building or outside on the terrace. On sunny days, the château's open-air picnic area is another favorite spot. The Château of Cheverny is an easy (approximately two-hour) car ride or train ride from Paris. The best option by train is from the Paris Austerlitz station to the Blois-Chambord station and then a short (16-kilometer) taxi ride to the château. Azay-le-Rideau is renowned for its magnificent Renaissance château, a dreamy fairy-tale-like building that is surrounded by a moat and lovely gardens. The Château d'Azay-le-Rideau was built in the 16th century by a wealthy financier. The design of this stately château was greatly influenced by Italian architecture. The most notable features on the ground floor are the rib-vaulted kitchen and the dining room with a richly decorated chimney and numerous tapestries. Sumptuous Renaissance furniture and paintings decorate the reception rooms. In the town of Azay-le-Rideau, there is an interesting church, the Eglise Saint-Symphorien, that blends Romanesque and Gothic styles. The facade of the south aisle reveals remains of Carolingian reliefs. In the nearby Château of Saché, the famous author Honoré de Balzac (1799-1850) wrote some of his novels. The room where Balzac worked has been preserved as it was. Only ten kilometers away from Azay-le-Rideau is another spectacular château: Château de Langeais, one of the fastest-built châteaux in the Loire Valley. The château was constructed by King Louis XI in only four years from 1465 to 1469. This striking landmark has remained unchanged for centuries; the medieval rooms with their original decorations and wall-hangings are particularly worth seeing. King Charles VIII was married here to Anne de Bretagne in 1491. Travelers visiting this area can spend the night in regal style at the nearby Château de Rochecotte, about 20 kilometers away from the Château d'Azay-le-Rideau. This 4-star hotel was formerly the residence of the Prince de Talleyrand and the Duchesse de Dino. Ensuring a luxurious experience, the spacious, bright guest rooms feature plush decor and sensational views of the gardens, while the château's upscale dining room serves a delicious lunch menu and afternoon tea, with desserts prepared by the restaurant's pastry chef. The property's 20 hectares of wooded parkland includes formal gardens, an Italianate terrace, and a heated swimming pool. The Château de Valençay was built in stages from the medieval era through the Renaissance period, and for this reason the building blends a variety of architectural styles. The main wing reveals design elements inspired by the Italian Renaissance, while the two-story side wing is Baroque. The side wing also shows the influence of Charles-Maurice de Talleyrand-Périgord (Prince Talleyrand), Napoleon's foreign minister, who acquired the château in 1803 and resided here in rooms outfitted with Empire furniture. One of the highlights of the château is the Family Portraits Gallery, adorned with paintings that depict Talleyrand's ancestors. As a tribute to Prince Talleyrand, the château's Salle des Trésors (Hall of Treasures) displays a collection of personal items that belonged to the savvy Lord of Valençay, who was known for his business acumen, diplomatic talents, and art of living. Similar to many royal estates, the Château de Valençay encompasses vast grounds. Set in a 53-hectare park including lush forests, the property features immaculately manicured Formal Gardens with a profusion of flowerbeds, sculptures, decorative pools, and fountains. Ideal for relaxing, some of the grassy spaces of the gardens are designated as picnic areas. The woodland portion of the grounds features a four-kilometer path that traverses the forest for taking invigorating nature walks (alternatively electric golf carts are available). Another exceptional estate nearby is the Domaine de Poulaines in the town of Berry (only seven kilometers away from the Château de Valençay). Nestled in a 20-hectare woodland, the Domaine de Poulaines offers 4.5 hectares of marvelous themed gardens, awarded the "Jardin Remarquable" ("Remarkable Garden") label in 2014. A refreshing outdoor space with shady 100-year-old trees; an English landscape garden planted with roses, dahlias, and peonies; an aromatic herb garden; koi pond; and an Arboretum with 400 different varieties of trees make this property a special place. 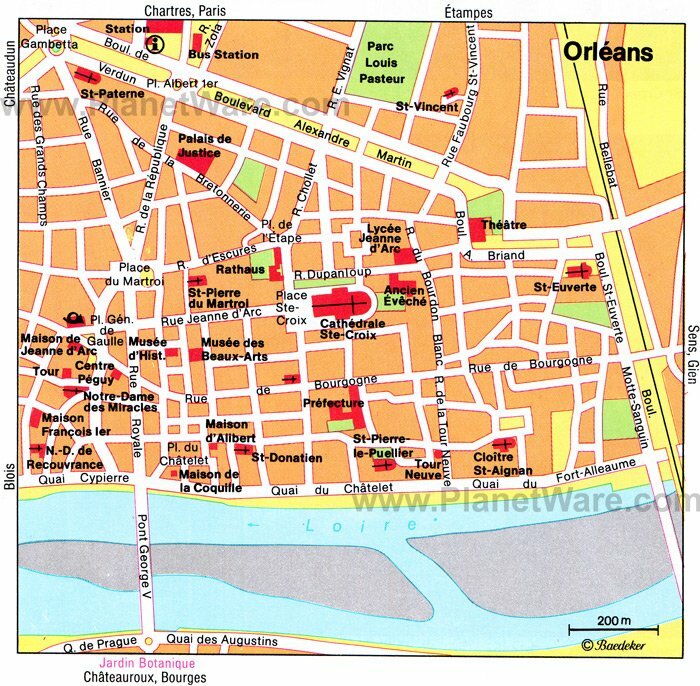 The largest town in the Loire Valley after Tours, Orléans is a good base to begin exploring the region. Inseparably bound with the history of Joan of Arc, the city owes its survival to the 17-year-old "Maid of Orléans," who helped lead the French to victory against the English when Orléans was besieged in 1429. A small museum in a restored 15th-century house, the Maison de Jeanne-d'Arc is devoted to Joan of Arc, who is now recognized as a saint by the Catholic Church. Another landmark associated with Joan of Arc, where she spent time in silent prayer, is the 13th-century Cathédrale Sainte-Croix. The cathedral's monumental exterior features twin towers (81 meters high), five doorways, and elaborate Baroque decoration. The sheer size of the interior leaves a lasting impression, while colorful stained-glass windows allow visitors to marvel at the history of Joan of Arc. For a further immersion into the city's culture, tourists can peruse the art collection at the Musée des Beaux-Arts, which displays around 700 artworks (paintings, sculptures and decorative objects) from the 15th to the 20th century, such as pieces by Correggio, Tintoretto, Delacroix, Gauguin, and Picasso. About 27 kilometers away from Orléans is the Château de Meung-sur-Loire, one of the oldest castles in the Loire Valley. Set in expansive parklands, the château reveals the evolution of French architecture with its variety of architectural details, from 12th-century towers to the 18th-century facade. The castle also played a strategic role for Joan of Arc in 1429 at a crucial moment during the Hundred Years' War. The medieval town of Amboise was built up along the left bank of the Loire River (about 25 kilometers east of Tours) with dense forest in the background. The city's most fascinating attraction is the Château Royal d'Amboise, where French kings resided for five centuries. Standing proudly on a rocky cliff at nearly 40 meters high, the château offers a fantastic vantage point of the Loire Valley landscape. Mostly built during the reign of Charles VIII in the 15th century, the castle exemplifies late Gothic architecture with its richly articulated facade and imposing round towers. For more royal history, tourists can visit the Chapelle Saint-Hubert, built around 1491 for King Charles VIII and his wife Anne de Bretagne who was the Duchess of Brittany. The chapel is a fine example of Gothic architecture, with intricate sculptures and gargoyles on the facade and a jewel-box interior illuminated by brilliant stained-glass windows. Another top attraction in Amboise is the Château du Clos Lucé, where Leonardo da Vinci spent the last three years of his life. At this splendid property, visitors can learn all about the great Renaissance man. Throughout the year, the Château du Clos Lucé presents permanent exhibitions about Leonardo da Vinci's life story and accomplishments. From April through December, temporary "Cultural Season" exhibitions focus on Leonardo da Vinci's projects and original ideas (such as his studies of birds and his vision for creating a flying vehicle). Visitors should leave time to wander around Leonardo's Garden, which abounds with burgeoning plant species that inspired Leonardo da Vinci's interest in botany. Perched on two hills above the Loire River, the historic city of Blois is full of old-world ambience. The typical characteristics of a medieval town are all found here: narrow medieval streets, half-timbered buildings, a monumental château, and a soaring cathedral. Boasting a regal pedigree, Blois was a royal residence for seven French kings. During the King Louis XII and King Francis I reigns, the town played a similar role to that of the Château de Versailles for Louis XIV. Originally a fortified citadel, the Château Royal de Blois reflects changing architectural styles of the eras it was built (13th through 17th centuries). For instance, the Francis I wing is a masterpiece of Renaissance architecture with a grandiose octagonal staircase. A short walk from the château is a former Benedictine church, the 12th- to 13th-century Eglise Saint-Nicolas, renowned for its stained-glass windows that brighten the harmonious sanctuary. Standing on high ground in the old town, the Cathédrale Saint-Louis surprises visitors with its simple, unadorned vaulted interior and contemporary stained-glass windows. After taking a look at the cathedral, tourists should take time to admire the handsome old burghers' houses nearby. History buffs will also appreciate the town's Musée de la Résistance (at Place de la Grève), which chronicles the French resistance efforts, the Occupation period, and the Liberation at the end of the Second World War. About 18 kilometers away from Blois, the Château de Chaumont appears as if it's straight from the page of a fairy tale. This multi-towered and turreted fortress-like château was founded in the year 1000, rebuilt by King Louis XI around 1465 and acquired by Catherine de Médicis in 1550. The château's apartments, including the Catherine de Médicis room, are beautifully appointed with historic tapestries and works of art. Many of the rooms have been recently embellished with renovated furnishings and decor, allowing visitors to appreciate the château in all its original glory. Both the château and its English-style gardens are open to the public. Adding to its tourist appeal, the Domaine de Chaumont-sur-Loire presents contemporary "Art Season" exhibits, changing annually to showcase the work of emerging artists, with artworks, sculptures, and creative installations displayed throughout the château and gardens. The château also hosts the "Festival International des Jardins," a garden design festival that draws inspiration from concepts in literature and poetry. This historic city is a pleasure to discover by taking a leisurely stroll. 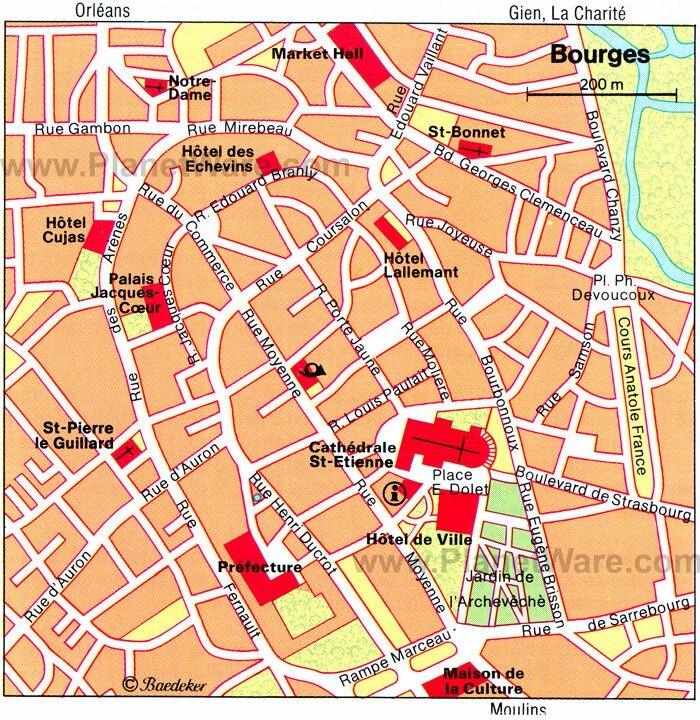 A walk through the cobblestone streets between Place Plumereau and the Place du Grand-Marché will give an impression of the character of Vieux Tours (the old town). With its tree-lined courtyard space, bustling outdoor cafés, and handsome half-timbered houses, the Place Plumereau is a particularly inviting place to stop. Tourists should plan to spend some time at the Cathédrale Saint-Gatien to admire the Flamboyant Gothic facade, as well as the glorious vaulted sanctuary, illuminated by 13th-century stained-glass windows. To the south of the cathedral is the Musée des Beaux-Arts de Tours, which showcases masterpieces of fine art from the 14th to the 20th century, including paintings by Rubens, Rembrandt, Delacroix, Degas, and Monet. To the north of the cathedral, the medieval Château de Tours presents photography exhibitions created in partnership with the Musée Parisien de la Photographie. For another dose of culture, tourists can continue walking (about 15 minutes west of the Château de Tours) to the Hôtel Goüin, a Renaissance mansion that now welcomes visitors for art and photography expositions, as well as music performances. Once the capital of Anjou county, Angers is dominated by the Château d'Angers, perched majestically on a 32-meter-high crag above the Maine River. Built in the 13th century as a fortress, this vast citadel is enclosed by stout defensive walls, with 17 round towers. In the 14th and 15th centuries, court life flourished here under the Dukes of Anjou, patrons of the arts. The château is known for its tapestry collection, most notably the Tapestry of the Apocalypse, an important work of medieval art. One of the fun things to do while visiting the castle is to take a walk along the ramparts, which afford panoramic views of the surrounding landscape. In the old town of Angers, the Cathédrale Saint-Maurice d'Angers surprises visitors with its unusual architectural details. The spacious interior features three large domes (constructed in the 12th century) known as "Angevin Gothic" or "Plantagenêt" vaulting. Another dazzling impression comes from the cathedral's medieval stained-glass windows, in particular the "Glorification de la Vierge" window. A short walk south of the cathedral, the Musée des Beaux-Arts has a superb collection of fine art housed in a stately 15th-century hôtel particulier. Also not to be missed is the Collégiale Saint-Martin, a Romanesque church with elements dating to the Merovingian (5th and 6th centuries) and Carolingian (10th-century) eras, as well as the Gothic period. Other cultural attractions include the Galerie David d'Angers, which displays the sculptures of Pierre-Jean David in a renovated 13th-century abbey church; the Musée Jean Lurçat et de la Tapisserie Contemporaine, which showcases contemporary tapestries; and the Musée Pincé, devoted to Greek, Egyptian, Roman (and other) antiquities. Topping the vacation to-do list for families with kids is to spend a day at Terra Botanica, an amusement park with a botanical-themed twist. 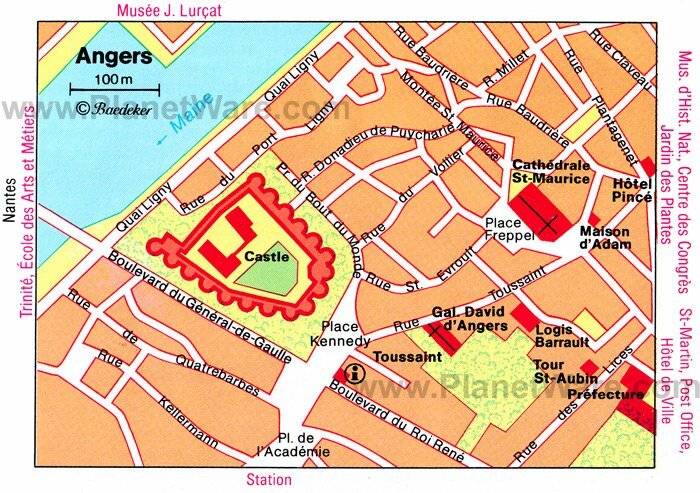 (The park is a 10-minute drive outside the historic part of Angers on the Route d'Epinard.) Within the extraordinary gardens of Terra Botanica, around 275,000 diverse plant species thrive: roses, dahlias, orchids, water lilies, rare vegetables, herbs, spices, tropical palms, cactuses, and thousand-year-old trees. Grown-ups will adore the beautiful Rose Garden and the traditionally landscaped Grandma's Path, while kids will love the play area, boat rides, Butterfly Greenhouse, and the hanging gardens on Elves' Island. With its ruined castle looming from above on a steep ridge of a hill, the town of Chinon has a romantic ambience. The old town lies between the fortress and the Vienne River. The Forteresse Royale de Chinon dates back to the 10th century and is a masterpiece of medieval architecture. Joan of Arc had an important meeting with the Dauphin Charles here in 1429. The Rue Voltaire, with its 15th- and 16th-century houses, and the 12th-century Church of Saint-Maurice are particularly worth seeing. The most important event in the history of Chinon was the meeting between Charles VII and Joan of Arc on March 9, 1429, which marked the beginning of the reconquest of French territory from the English. A vision of a fairy-tale fantasy is found 12 kilometers from Chinon at the Château d'Ussé, the castle that provided inspiration to Charles Perrault, who wrote the "Sleeping Beauty" story in the 17th-century. Built in stages between the 15th and 17th centuries, the Château d'Ussé shows a mingling of Late Gothic and Renaissance architecture. The rooms feature Florentine and Louis XV furniture, 16th- and 17th-century tapestries, and marble marquetry. Visitors are also impressed by the castle's unique spiral staircase and the grand staircase designed by Mansart, architect of the Château de Versailles. The grounds rank among the Loire Valley's prettiest gardens, created by Le Nôtre (known as the "King's Gardener"), who landscaped Versailles. Tucked away in a peaceful spot of the property is the Collégiale Notre Dame d'Ussé, dedicated to Sainte-Anne d'Ussé. This 16th-century chapel exemplifies pure Renaissance style. The Château d'Ussé is owned by the Duke of Blacas and has been a private home in the family for more than two centuries. Although most famous for its car race, Le Mans is worth discovering for its cultural heritage. Surrounded by remnants of ancient Gallo-Roman walls and brimming with old-world charm, the historic section of Le Mans known as the "Cité Plantagenêt" (named after Geoffrey Plantagenet, the Count of Anjou, and Maine counties), is a delightful escape from the modern world. This historic gem of an old town covers 20 hectares, filled with cobblestone streets, half-timbered houses, and Renaissance mansions. The main thoroughfare of the Cité Plantagenêt is the Grande Rue. 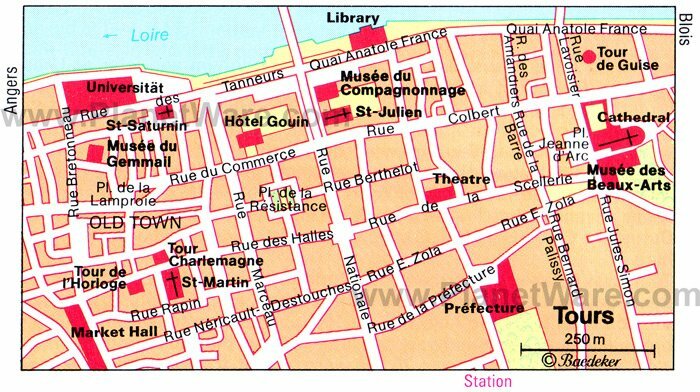 Tourists should stop to notice the Renaissance mansion, Maison d'Adam et d'Eve (69 Grand Rue at the crossing of Rue du Bouquet), before ambling along the Rue de la Reine Bérengère until reaching the Cathédrale Saint-Julien. First-time visitors are struck by the cathedral's incredible facade, especially the abundance of flying buttresses and the fabulously detailed sculpting. The sanctuary is among the finest in France, with medieval stained-glass windows rivaling Chartres Cathedral, especially the Ascension window, and ceiling paintings in the Chapelle de la Vierge, which depict 47 angelic musicians. Another top tourist attraction near the cathedral is the Musée de la Reine-Bérengère, dedicated to regional history and culture. Also within the Cité Plantagenêt are two pleasant green spaces, the Bicentenary Square on the Rue de la Verrerie, which has a rose garden and benches for relaxing, and the Robert Triger Square, with a view of the cathedral and a small garden of aromatic plants. Just outside the Cité Plantagenêt is the Musée de Tessé, a fine arts museum that displays paintings, sculptures, and decorative objects from the 12th to 20th centuries, as well as Egyptian antiquities. Also beyond the Cité Plantagenêt is the Eglise Notre-Dame-de-la-Couture, a former Benedictine abbey church with a Virgin and Child statue sculpted by renowned Renaissance artist Germain Pilon. On the right bank of the Sarthe River, the Eglise Notre-Dame-du-Pré offers the chance to experience a serene Romanesque sanctuary. Of course, car-racing enthusiasts will want to visit the Sarthe Automobile Museum (near the Circuit des 24 Heures race track) to learn about the race and see the actual winning vehicles. Halfway between Angers and Tours, the medieval town of Saumur is at the heart of the historic Anjou region where the pastoral landscape is dotted with woodlands, vine-covered hills, flower fields, and small farms. Saumur has one of the most impressive of the Loire Valley châteaux, built in the 14th century on a hill high above the Loire River, creating a striking impression from far in the distance. Originally, the Château de Saumur was the property of the Count of Anjou, then the Plantagenêt dynasty and later was converted into a royal residence by King Saint Louis IX in the early 13th century. In the 15th century, the castle became the royal domain of King René, who called his resplendent palace the "castle of love." Designed around an open courtyard, the château is entered through a large and imposing doorway. Inside, the Château de Saumur contains the Musée de Saumur, which has a collection of decorative works of art, furniture, tapestry, and ceramics from the 14th to 18th centuries along with an assortment of equestrian objects. In addition, the museum presents temporary expositions throughout the year, while the château hosts (French-language) cultural events during summertime, such as open-air film screenings. Tourists can visit the castle's gardens and the outdoor terrace overlooking the Loire Valley landscape. Those interested in French gastronomy can discover an important culinary ingredient that's cultivated in the area around Saumur: "Champignons de Paris" (known as "button mushrooms"). In fact, the region's mushroom farms (champignonnières) supply three-quarters of all the Champignons de Paris mushrooms produced in France. Derived from a variety of wild mushroom, the Champignons de Paris are now grown in mass quantities in the region's underground cellars. The prized culinary ingredient is destined for use in Coq au Vin (chicken in wine sauce), Boeuf Bourguignon (Beef Burgundy), traditional quiches, and other recipes. The Musée du Champignon gives visitors a peak into the intriguing world of mushrooms. Within the museum's chilly caves, several different varieties of cultivated mushrooms are on display, including Champignons de Paris, oyster mushrooms, and reishi Mushrooms. Self-guided tours (with information available in French and English) or guided group tours in French or English provide an in-depth educational experience. Adding to the fun, the museum allows visitors the chance to sample various appetizers prepared with mushrooms. Originally designed as a citadel, the Château de Montreuil-Bellay has a fascinating history. The château earned its reputation as impregnable because it withstood a siege by the Count of Anjou in the 12th century. In the 13th century, the château was used as a hunting lodge and hosted elaborate feasts. During the Hundred Years' War, peasants took refuge in the castle moat and neighboring monasteries. Later, when the Wars of Religion broke out, both the Catholics and Protestants turned to this location to refuel weapons and ammunition. By the late 15th century, the château served as a country manor estate instead of a fortress. As the castle's purpose changed throughout the centuries, the architecture evolved. The original austere fortress, with its 650 meters of ramparts and 13 defense towers, was transformed into a luxurious palace. Open to the public for guided tours, the Château de Montreuil-Bellay gives tourists access to view two levels of the building: the cellars and the fully furnished rooms of the ground floor, including the Duchess of Longueville's bedroom; a well-preserved medieval kitchen; a beautifully decorated drawing room; a dining room with traditional beamed ceiling; and a small music room. The castle grounds include verdant gardens, filled with shady lime trees and fragrant roses. Also on the property is the 15th-century Collégiale Notre-Dame church, decorated with the coats of arms of the château's Lords. Built in the 16th century for Jean Le Breton, Minister of Finance to King François I, the Château de Villandry is renowned for its gorgeous Renaissance gardens. The French-style landscaping was first laid out in the 16th century. From the upper floor of the château, a flight of steps leads down to the gardens, which cover an expansive area of five hectares. To the left is the Ornamental Garden, with four "salons" of meticulously arranged greenery. The first salon, called the "Garden of Love," is designed in the style of gardens found in Andalusia (with four geometric beds); each bed of flowers represents a different type of love. Beyond the Ornamental Gardens is the Kitchen Garden, planted with vegetables laid out in decorative geometric forms. Reminiscent of medieval monastery gardens, the Herb Garden boasts 30 varieties of culinary and medicinal herbs, planted in circular beds to symbolize eternity. Other highlights include a maze of "charmilles" (hornbeam hedges), the Water Garden, featuring an ornamental pond, and the view of the village of Villandry and its Romanesque church in the distance. The château's eagerly awaited "Nights of a Thousand Lights" take place on several evenings in July and August, when the gardens are illuminated with 2,000 candles. At this special event, visitors can take a romantic stroll through the gardens in their magical state, while enjoying entertainment and fireworks. Listed as one of the "Plus Beaux Détours de France" (Most Beautiful Detours of France), the historic town of Loches offers old-world charm, alluring gardens, and picture-perfect scenery alongside the Indre River, a left-bank tributary of the Loire. On the hill above the modern section of Loches is the Cité Médiévale, the medieval city, fortified by a circuit of ramparts stretching two kilometers long. Tourists enter the Cité Médiévale through the 14th- to 15th-century Porte Royale, a gate once approached by a drawbridge. Within this walled city is a captivating medieval world of winding cobblestone streets, quiet pedestrian lanes, and ancient Tuffeau stone buildings. Built on a rocky spur (inside the Cité Médiévale) is the Collégiale Saint-Ours, a Romanesque church originally founded in 962 but mostly dating to the 12th century, and the Château de Loches, dating from the 15th to 16th centuries. Once the residence of King Charles VII, the château is where Joan of Arc met with Charles VII and encouraged him to travel to Reims for his coronation. The Salle Jeanne d'Arc contains a small collection of weapons and an assortment of antique tapestries. A worthwhile detour from Loches is 18 kilometers away to Montrésor, a quaint little town on the banks of the Indre River listed as one of France's "Most Beautiful Villages" ("Plus Beaux Villages"). Presiding over the town and the surrounding bucolic landscape is a medieval château built in the 11th century by Foulques Nerra, the Count of Anjou. The town also has a noteworthy 16th-century church, the Collégiale Saint Jean-Baptiste, which is a masterpiece of Renaissance architecture. A visit to Montrésor could easily be combined on a driving itinerary that includes the Château de Chenonceau (30 kilometers north). The largest monastery in Europe, the Abbaye Royale de Fontevraud is nestled in a verdant valley near the Loire River and encompasses 13 hectares of parkland. The Benedictine abbey was founded in 1099 by an eclectic and iconoclastic preacher named Robert d'Arbrissel, considered a radical because he created a community for people of diverse social backgrounds. Another unusual fact is that the abbey was always run by an abbess, who governed both male monks and female nuns. 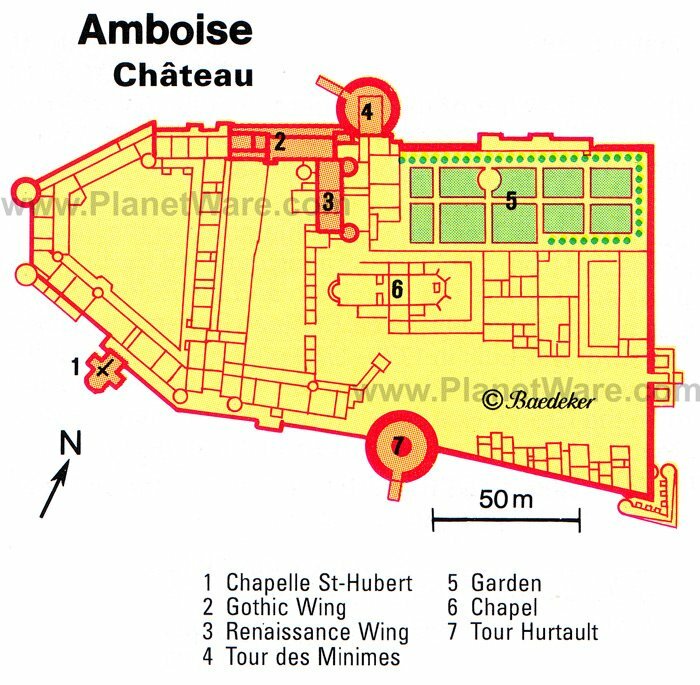 A succession of 36 abbesses ran the abbey over the course of seven centuries. Queen Eleanor of Aquitaine, wife of King Henry II of England, had strong ties to the abbey, which was her favorite place of worship. During the last years of her life, Queen Eleanor lived at the abbey, and she commissioned the effigies of herself, as well as her husband, that are in the abbey church. The Fontevraud Abbey is now open to the public; visitors can tour the main priory; the Romanesque abbey church (built between 1105 and 1165); an interesting Byzantine kitchen, complete with the original fish smokehouse used to make smoked salmon; and a lush garden planted with vegetables, herbs, and fruit trees. Another highlight of visiting the abbey is its gourmet restaurant. For those who would like to spend the night at a spiritually inspiring retreat, the four-star hotel on the property pampers guests with luxurious, contemporary-style rooms in the former Saint-Lazare priory. The Royal Abbey of Fontevraud could be a good addition to a tour itinerary with Saumur (14 kilometers way) and Chinon (16 kilometers away). In the heart of the Loire Valley, just 10 kilometers from Blois and 20 kilometers from Chambord, the Château de Beauregard is the old hunting lodge of King Francis I, who reigned during the first half of the 16th century. During the 16th and 17th centuries, the castle served as a residence for the French king's ministers. This stately building reflects the grandeur of its rich heritage. Three centuries of France's history are represented in the château's portrait gallery, with 327 portraits of kings and important political figures. An expansive parkland surrounds the castle, including gardens planted with ancient cedars, cherry blossom trees, and flowering plants. Depending on the season, vibrant azaleas, camellias, rhododendrons, and a hundred variety of fragrant heirloom roses enliven the grounds. Those who spend more time wandering will come across the ruins of a 14th-century chapel, a landmark on the medieval pilgrimage trail to Santiago de la Compostela. Also on the property are vacation cottages that are available to rent for overnight accommodations. On the banks of the Loire River, this elegant historic town was an important medieval pilgrimage destination. The Abbaye de la Trinité, was first built here in the 11th century. In the 13th century, the Romanesque abbey was rebuilt in grand Gothic style with an opulent facade, an impressive vaulted nave, and Flamboyant Gothic windows. The abbey gained a reputation as a stopover, close to Saint Martin's tomb in Tours, along the pilgrims' road to Santiago de Compostela. At the center of Vendôme is the Place Saint-Martin, and nearby is the Tour Saint-Martin, all that remains of a Renaissance church. Other noteworthy churches in Vendôme include the Chapelle Saint-Jacques, a Gothic chapel now used for cultural expositions, and the 15th-century Eglise Sainte-Marie-Madeleine, with lovely stained-glass windows. One of France's Most Beautiful Villages (Plus Beaux Villages), Lavardin is 18 kilometers away from Vendôme amid the rolling hills and cliffs of the Loire Valley. To arrive at the village, visitors must traverse a Gothic bridge that spans the Loire River. The ruins of an old château give this picturesque village a romantic charm. The fortified castle withstood an attack by Richard the Lionheart but was overtaken by King Henry IV's troops. The village features a mix of architectural styles and periods, from Gothic to Renaissance, and even some cave dwellings. Châteaudun is perched high on a rocky outcrop, the perfect defensive location during the Middle Ages. In the 12th century, the Count of Blois chose this lofty, difficult-to-access spot to build a fortress featuring a massive 31-meter tower, and that feudal castle is considered the first château of the Loire Valley. In the mid-15th century, the Château de Châteaudun became the property of comrade-in-arms and close friend of Joan of Arc Jean de Dunois, who tore down the old wing of the castle to construct the Sainte-Chapelle (a Holy Chapel designed to hold a relic, the Cross of Christ). After the Hundred Years' War, the château was enhanced in Renaissance style to suit a more leisurely and luxurious way of life. The room decor became more refined, and large kitchens were added to prepare princely meals. On the castle's attractive grounds, the unique hanging garden reflects a taste for the lavish. From the château's outdoor terrace are stunning views of the Loire landscape. Near the château is the old town of Châteaudun, a jumble of cobblestone streets and pedestrian streets enclosed within ancient ramparts. While strolling atmospheric lanes, visitors are delighted to discover many quaint half-timbered houses (mainly on Rue Saint-Lubin and Rue des Huileries) and several historic churches, including the Eglise de la the Madeleine with a Romanesque facade. Tourists will also enjoy the town's pleasant parks and the wide selection of shops and restaurants. Outside the medieval town, in the more modern area of Châteaudun (at 3 Rue Toufaire), is another interesting tourist attraction, the Musée des Beaux-Arts et d'Histoire Naturelle (Museum of Fine Arts and Natural History), which displays a diverse collection of archaeological objects, paintings, fine porcelain, and interior decor. Saint-Benoît-sur-Loire is famed for its great Benedictine abbey, the Abbaye de Fleury, which was founded in the 7th century. The abbey's bright and beautifully proportioned basilica, built between 1067 and 1218, is one of the finest Romanesque churches in France. The most outstanding feature of the church is the porch tower, with its ornately carved capitals. Inside the 12th-century crypt are the relics of Saint Benedict, brought here from the Abbey of Monte Cassino (near Naples in Italy) in the late 7th century. The monastic community of the Abbaye de Fleury was dissolved at the time of the French Revolution but was re-established in 1944 by a group of Benedictine monks. Today this working monastery has a community of 32 monks and nuns. Besides the spiritual aspect of the monastery, the Abbaye de Fleury has two artisanal workshops: the Atelier de Porcelaine, where monks handcraft porcelain plates, mugs, and bowls, and the Atelier de Confiserie, where specialty confections such as fruit candies, caramels, and honey bonbons are created. Although much of the abbey is reserved for use by the monastic community, the basilica is open to the public; visitors may spend time in prayer, take a guided tour, or attend a concert (classical music performances are occasionally held on Sunday afternoons). This 16th-century manor house is in the small village of Tour-en-Sologne, 10 kilometers away from the Château de Chambord. Built for Jean le Breton, the finance secretary of King Francis I, and later the residence of noble families, the Château de Villesavin was created by French and Italian master craftsmen and builders who had constructed grand royal palaces such as Chambord. Unlike many castles of the Loire Valley, the Château de Villesavin has been well maintained in its original state for four centuries and today is still a private home, owned by the Sparre family, who have kept the castle in the family for three generations. The château's 27-hectare property includes tranquil green space and pristine forests filled with many animals. Visitors can often see deer, rabbits, and squirrels. Families with kids will have fun at the castle's Ferme des Petits, a miniature farm where chickens, cows, donkeys, goats, rabbits, and sheep are raised. Children are given a small bag of bread to feed the gentle farm animals. Other tourist attractions on the property include the Musée du Mariage, with a collection of vintage wedding dresses, and trousseau à la chambre nuptiale (bridal trousseau) items, and the Musée de Voitures Hippomobiles et d'Enfants (Museum of Hippomobiles and Children's Cars), which displays a unique assortment of 19th-century horse-drawn vehicles and children's cars that were pulled by dogs, goats, or sheep. Like the castles of fairy-tale imagination, the Château de Sully-sur-Loire has soaring towers and is encircled by wide moats that are filled with water. The imposing appearance reflects the original military purpose of the medieval château. When Maximilien de Béthune (the Duke of Sully) bought the property in the early 17th century, he added an artillery tower and defensive walls reinforced by canons to ensure an impenetrable fortress. The interior has been updated throughout the centuries and features a wonderful collection of paintings and tapestries. Especially interesting are the apartments of the Duke of Sully and his wife, and the Hall of Honour family portrait gallery. The château also has a large park, offering a peaceful retreat in nature. A remarkable piece of living French history, the Château de Brissac has been in the same family for more than twenty generations. It is currently owned by the 13th Duke of Brissac, descendants of Lord René de Cossé, who purchased the castle in 1502. The Marquis Charles-André and the Marquise Larissa de Brissac reside in the château along with their four children. Besides its prestigious heritage, the Château de Brissac has the distinction of being the tallest château in the Loire Valley, thanks to its seven stories and 204 rooms. The majestic castle is set in a landscaped park with Romantic-style gardens, many benches, and walking paths. The palatial interior features rooms with gilded ceilings, exquisite furniture, and Venetian chandeliers. One of the most delightful rooms is the castle's 200-seat Belle Epoque opera house. For those who'd like to feel like landed gentry for a few nights, the castle offers bed and breakfast accommodations. Guest rooms are decorated with authentic antique-style furnishings and have views of the park's woodlands and meadows. The Château de Brissac also hosts many summertime events, as well as an Easter Egg Hunt on Easter Sunday and a Christmas market and holiday festivities in December.